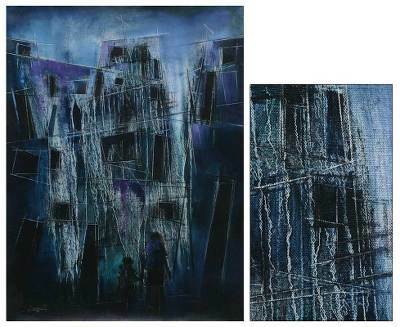 Blue Neighborhood Impressionist Painting from Peru, "Refuges"
"In the olden days of the Tallan culture people built their houses with noble materials, such as adobe and bricks, and they always looked warm and inviting," observes Andean artist Joaquin Ramos. "Nowadays, there's hardly anywhere left to build this type of houses. There are skyscrapers everywhere, and they have transformed what once was calm, into a busy and stressed skyline. Where once all was calm and home was a refuge, it is all chaos."